If your child likes Spider-Man and would love a cool towel then you should check out this Spider-Man hooded towel. The towel is red and blue and has the big spider on the front and back and the hood has the Spider-Man face. 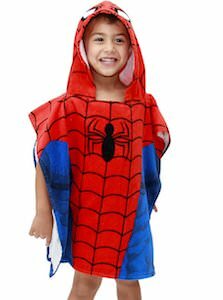 The towel is made from 100% cotton and is great for kids ages 3 – 7 and as it is a hooded it is kinda like a Spider-Man poncho and that will make you child get warm a lot quicker when they get out of the bath or shower. All the little Spider-Man fans are going to love you when you are surprising them with this amazing superhero towel.